Xeljanz (tofacitinib citrate), an oral DMARD (disease-modifying anti-rheumatic drug), was approved by the U.S. Food and Drug Administration (FDA) on November 6, 2012. 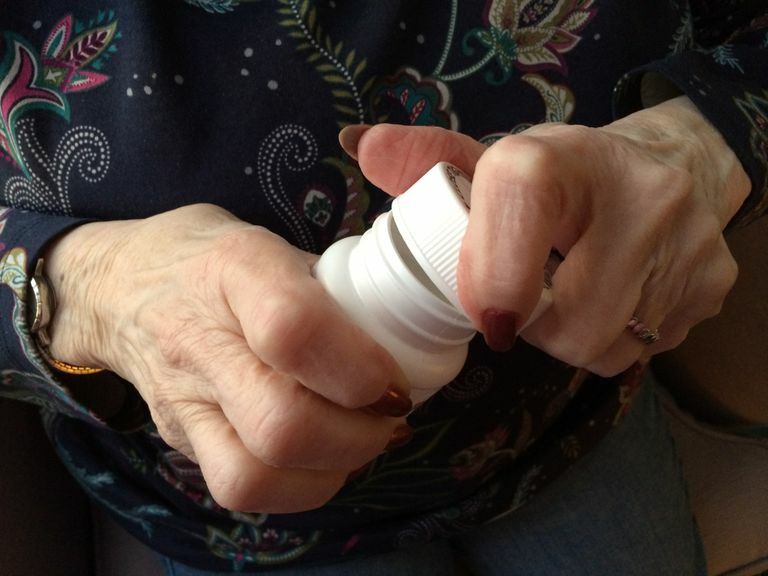 The drug is intended for the treatment of adults with moderately- to severely-active rheumatoid arthritis who have had an inadequate response, or intolerance, to methotrexate. Manufactured by Pfizer, Xeljanz is a round, white, immediate-release, film-coated tablet with "Pfizer" on one side, and "JKI5" imprinted on the other side. Xeljanz is the first oral DMARD approved for rheumatoid arthritis in 10 years. It's also the first in a new class of medicines known as JAK (Janus kinase) inhibitors. Xeljanz can be used as monotherapy (alone), or combined with methotrexate or other non-biologic DMARDs. Xeljanz should not be used with biologic drugs or powerful immunosuppressants, such as Imuran (azathioprine) or cyclosporine. Basically, Xeljanz works by inhibiting the JAK pathway -- a signaling pathway inside cells that plays a significant role in inflammation associated with rheumatoid arthritis. JAKs are intracellular enzymes that transmit signals which arise from cytokine or growth factor-receptor interactions on the cell membrane. Xeljanz is considered a small-molecule medication, not a biologic drug. Biologics, such as Enbrel (etanercept), Remicade (infliximab), Humira (adalimumab), Cimzia (certolizumab pegol), Simponi (golimumab), Orencia (abatacept), Actemra (tocilizumab), and Rituxan (rituximab) block pro-inflammatory cytokines from outside the cell. More than 5,000 rheumatoid arthritis patients were involved in clinical trials for Xeljanz, producing one of the largest clinical databases for any rheumatoid arthritis drug ever submitted to the FDA for review, according to Pfizer. There were two clinical trials which assessed the optimal dose range of Xeljanz, and 5 clinical trials which evaluated the ACR 20 response to Xeljanz, as well as DAS28 and Health Assessment Questionnaire results. Clinical trials showed that Xeljanz significantly reduced the signs and symptoms of rheumatoid arthritis and improved physical function (the ability to perform usual daily activities). Xeljanz is taken orally, a 5 mg pill taken twice daily. It may be taken with or without food. An 11 mg once-daily dose is also now available as Xeljanz-XR (extended release). The most common adverse effects associated with Xeljanz, which occurred during the first 3 months of use in clinical trials, were upper respiratory tract infections, headache, diarrhea, and nasopharyngitis. Xeljanz carries a boxed warning: serious infections leading to hospitalization or death, including tuberculosis and bacterial, invasive fungi, viral, and other opportunistic infections, have occurred in patients receiving Xeljanz; if serious infection develops, Xeljanz should be stopped until the infection has been controlled; a latent tuberculosis test should be given before starting Xeljanz; patients taking Xeljanz should be monitored for active tuberculosis even if the initial test is negative; lymphoma and other malignancies have been observed in patients taking Xeljanz; "Epstein Barr Virus-associated lymphoproliferative disorder" has been observed in renal transplant patients treated with Xeljanz combined with immunosuppressive drugs. Other precautions: use Xeljanz with caution in patients at risk for gastrointestinal perforations; Xeljanz is not recommended for patients with severe liver disease; periodic laboratory tests are recommended because Xeljanz may cause changes to certain types of white blood cells, hemoglobin, liver enzymes, and lipids; patients taking Xeljanz should not receive live vaccines. Adequate studies of Xeljanz in pregnant women have not been performed. Xeljanz should only be used during pregnancy if the benefit of the drug outweighs the potential risk to the fetus. Xeljanz will have a wholesale acquisition cost of $2,055.13 for a 30-day supply (or $24,666 per year). Cost to patients will vary depending on contracts and insurance coverage. Xeljanz. Full Prescribing Information and Medication Guide. Revised 02/2016. U.S. Food And Drug Administration Approves Pfizer's XELJANZ (tofacitinib citrate) for Adults with Moderately to Severely Active Rheumatoid Arthritis (RA) Who Have Had an Inadequate Response or Intolerance to Methotrexate. 11/06/2012. Xeljanz, A Cheaper-But-Expensive $25,000-A-Year Pfizer Pill For Rheumatoid Arthritis, Gets FDA Green Light. Matthew Herper. Forbes.com. 11/06/2012.